The enhanced lifestyle, better infrastructure and ample opportunities to grow and prosper is the dream of the young, skilled and talented individuals living in the city of Hyderabad. However, these dreams can get the much-needed wings when they get the right guidance and subsequently, follow the right process. An efficient immigration consultant can really be the mentor they want to be provided it is genuine and trustworthy. There are many consultants and agencies active for immigration process assistance, however, selecting the genuine and trusted one is the task that one has to compete seriously. Visas Avenue is a registered Immigration and Visa Consultancy Company in India. 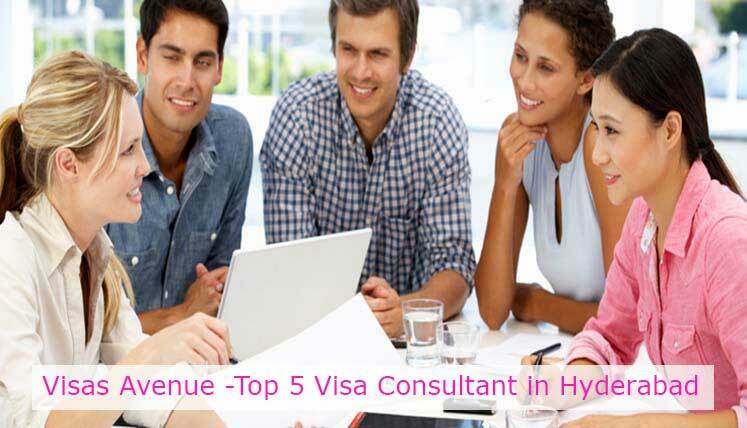 Visas Avenue leads the tally of Top 5 Immigration Consultants in Hyderabad. Its enhanced client based in last few years is the witness to the same. It has helped hundreds of visa applicants to get the desired visa and move to their destined country in the last few years. Excellent track record of Visas Avenue team has strengthened the confidence and faith of its clients on its services. Here are the key immigration associated services it offers to its clients. In Hyderabad, Visas Avenue office is located in Banjara Hills- one of the poshest locations in the city. Apart from Hyderabad, it also has its Visa consultancy offices in other top cities of India, i.e. Delhi, Mumbai, Bangalore, and Chennai. Today, it’s one of the most popular and top 5 Visa Consultancy Company in Hyderabad, especially for Canada and Australia immigration process. Find below the Hyderabad office address of Visas Avenue. Visas Avenue immigration experts and professionals are thorough with key immigration programs and procedures of Canada and Australia, i.e. Express Entry System, Comprehensive Ranking System, Provincial Nominee Program, etc. of Canada and General Skilled Migration (GSM), SkillSelect System, Subclass 189 Visa, Subclass 190 visa, etc. of Australia. Also read-What Makes Canada the Best Country to get Permanent Residency in 2018? If you wish to get the complete process assistance to apply for visa in Canada, Australia, New Zealand, USA, UK, etc. countries, you may contact accredited immigration and visa experts at Visas Avenue Hyderabad office at above contact details. You may also contact Visas Avenue immigration experts on Toll-Free Number- 78-18-000-777. Alternatively, e-mail your queries to Visas Avenue e-mail id- info@visasavenue.com.